The Fish Collection contains fifty patterns of fresh and saltwater fish. The Wildlife Collection contains fifty patterns of birds, frogs, butterflies, deer, moose, bears, squirrels, and many more. The Building Collection contains thirty patterns. Create Your Own Line Art Patterns! 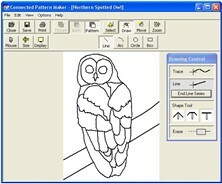 The Connected Pattern Maker is the easy to learn and fun to use software program that lets you create unique line art patterns from digital photographs, scanned pictures, and clip art images. The Connected Pattern Maker saves you time and money by streamling the design process. Quickly create patterns with the easy-to-use drawing tools. Print patterns to any size and with any line thickness.